Around the time when Barbara Zucker cofounded the country's first all-women cooperative gallery, which opened in 1972 in New York City, her work took two turns. She started "excis[ing] the male model from my vocabulary," as Zucker wrote by email to Seven Days. And she began exploring Asian art. Those decisions are evident some 47 years later in the work that comprises "Adorned: Hairstyles of an Ancient Dynasty," Zucker's current show at the BCA Center. The Burlington artist's work draws on women's elaborate, sculptural hairstyles during the Tang dynasty (618-907), a cultural zenith in China's history. 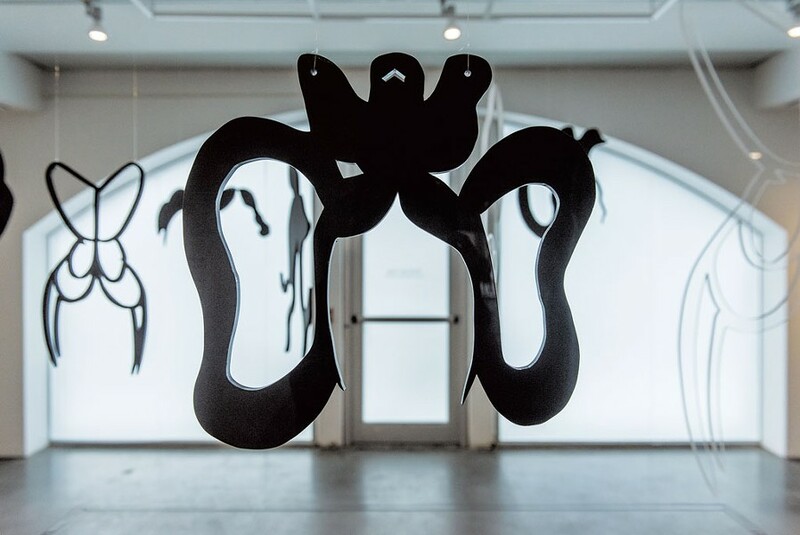 The hairstyles are rendered in black paint strokes on white paper in one painting and three collaged paintings, as well as in 10 sculptures cut from clear or black half-inch-thick plexiglass sheets that hang from a ceiling grid. The sculptures at first appear so abstract that they're nearly unrecognizable as hairstyles. Oversize and hung at eye level, they create a crowd of women whose faces are voids that one can imagine, after a moment, within the silhouetted hairdos. As the suspended works slowly turn, their fantastic shapes — pointed twists that must have reached imposing heights, enormous topknots, loops of all sizes — appear figurative one moment, abstract the next. Their forms are all the more astonishing for their historical accuracy. Zucker first spotted the hairstyles on small tomb sculptures that she saw at the Guimet Museum of Asian Art in Paris in 2006. "The [sculptures] were tiny — no more than 15 inches high — and exquisite. I was struck by these phenomenal, wacky-crazy hairdos," said the artist in a phone call from Florida, where she winters. Later, she learned that some of the more bulbous forms were made by wrapping the hair around wool. Zucker sketched the forms, saved the exhibit's only postcard and brought the lot to her studio on the Italian property of her husband, Burlington architect Louis Mannie Lionni. There she turned the drawings into paintings. At the end of that summer, she rolled up everything and put it in a corner. Later, Zucker recalled, her husband gave the property in Italy to his son, and she forgot about the work. A couple of years ago, Lionni had items shipped back to the couple's Vermont house, including the hairstyle paintings. Zucker mulled over them without touching them for at least another year. Eventually, she added small collaged details such as paper flowers and an image photocopied from that saved postcard. A sculptor at heart, Zucker said she "liked the idea that I could put these linear forms into space." She chose plexiglass, a material she had used in her 2010 sculpture "Time Signatures: My Luminaries (Homage to Linda and Lucy)." That work references two art historian-critic-curators, Linda Nochlin and Lucy Lippard, who inspired her to become a feminist artist in the early 1970s, she said. 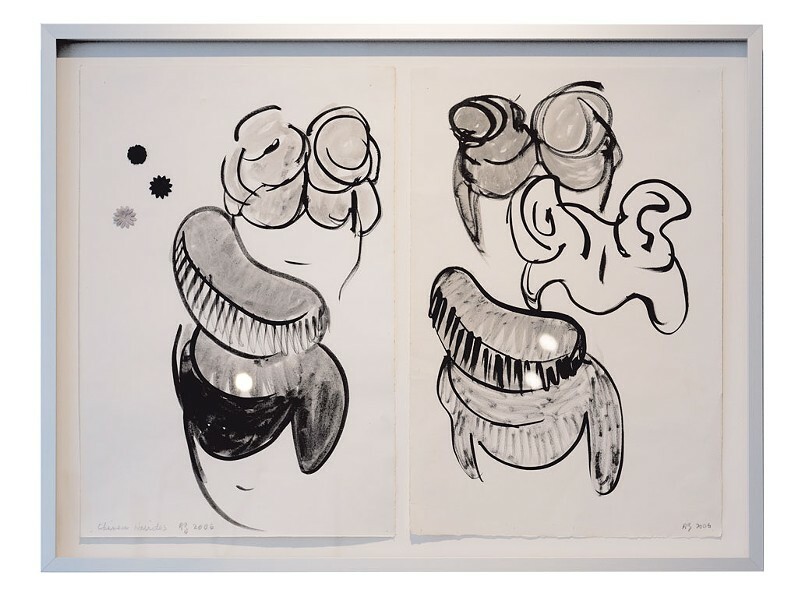 "Two Versions, Side by Side, 2006-2018"
Zucker created the sculptures in "Adorned" by reducing some of the paintings to line drawings, having them digitized and having the shapes cut from acrylic sheets. (Williston's Vermont Plastics Specialties did some of the work.) Two hairstyles are on exhibit in both black and clear acrylic; one of these, called "Three-Quarter View," is for sale in a limited edition of five. A pattern of three different Chinese characters composing the word "Tang" adorns one wall. The characters are rose pink, a color Zucker chose to "soften" the exhibit's black-on-white palette, she said. Appearing to be written on the wall, they were actually applied using masks, or reverse stencils. The artist patterned the masks after Chinese characters written by Weihong Lin, a professor at the University of Maryland, Baltimore County, whom Zucker found through a friend. Lin identified the dynasty for Zucker earlier this year, when the artist couldn't recall which one the statuettes belonged to, and proposed adding the Chinese writing to the exhibit. Zucker's art tends to honor women's beauty, comment on the cultural prescriptions applied to it or both. 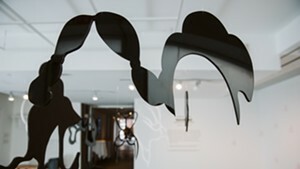 Her "Time Signatures" (1998-2013), exhibited at GreenTARA Space in North Hero in 2017, was a series of large steel cutout abstractions of older women's wrinkles that flowed across the walls in dramatic sweeps. "For Beauty's Sake" (1989-1997) tackled the phenomenon of cosmetic surgery with delicious humor in a series of paired before-and-after sculptures. One, "Liposuction: Stomach," abstracts a woman's presurgery abdomen as a single dot above an arc that suggests a sagging stomach; its mate is a lone dot with no arc. 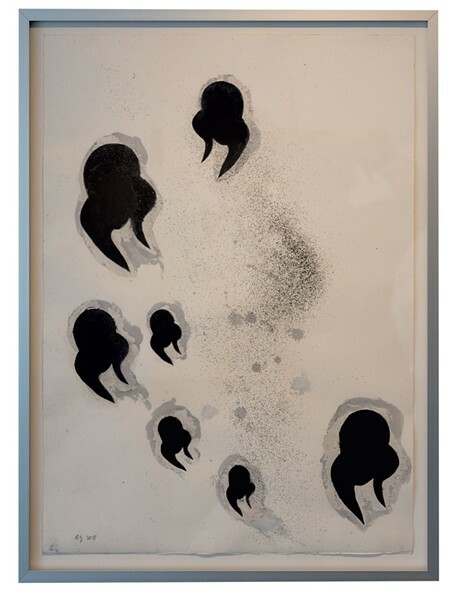 "Hairstyles Floating in Space, 2018"
Zucker acknowledged that "Adorned" may raise questions about cultural appropriation, but she insisted the series is primarily about the creation of beauty. "For me, these [tomb sculptures] were just beautiful," she said, as is "the density, the glossiness" of Asian hair itself. She applied the rose characters to the wall out of "respect for Chinese culture, for the beauty of it." Seen in this light — a welcome perspective, some would say, in the current climate of identity politics — the exhibit is an exploration of the role hair plays in the construction of female beauty. It evokes corollaries from many an era and place, such as Western white women's 1950s bouffant hairdos and African Americans' Afros of the 1960s. Zucker's talent for capturing the universal in the particular has been recognized by major institutions that hold her works in their permanent collections, such as the Elizabeth A. Sackler Center for Feminist Art at the Brooklyn Museum and the Whitney Museum of American Art. Her work will also be included in an upcoming show at the Museum of Contemporary Art in Los Angeles called "Lessons in Promiscuity: Pattern and Decoration in American Art, 1972-85." Meanwhile, Zucker's current BCA exhibit invites viewers to try on, in their mind's eye, an ancient culture's expression of beauty — and note its echoes in the present. The original print version of this article was headlined "Crowning Glory"